There are currently more than 100,000 satellites orbiting the Earth, from space junk, to high tech probes transmitting signals back to Earth. But one of these satellites is thought to be of extraterrestrial origin and has been circling our planet, prior to the launch of Sputnik. This mysterious spacecraft is known as the Black Knight satellite, alleged to be of alien provenance and covered up by NASA for more than 60 years. While most man-made satellites orbit in prograde, due to the ease and fuel efficiency of using the Earth’s natural gravitational pull, the Black Knight is said to orbit in retrograde, adding to its curious nature. But is it actually an alien satellite monitoring our planet, or simply a thermal space blanket like NASA has claimed photo evidence of it to be? Recently, a series of fast radio bursts were picked up by Stephen Hawking’s Breakthrough Listen Initiative, which some have speculated could be coming from the technology of an advanced, extraterrestrial species. This wouldn’t be the first time a scientist picked up signals from the cosmos and believed it to be of alien origin. Nearly a century ago, Nikola Tesla claimed to have recorded electrical signals at his laboratory in Colorado Springs that were of intelligent nature. Tesla had been working on the technology for his Wardenclyffe Tower, when he noticed signals which were not of earthly origin and could be ruled out as being weather-related. He believed the signals were being transmitted from a civilization on Mars, so he developed a device to send signals back out to make contact. Tesla was arguably the most well-versed in radio signal transmission at the time, having pioneered the technology, so it’s hard to imagine that he would have been confused by any earthly interference. No one knows exactly what those signals were that Tesla picked up, but some believe that it might have been a transmission from the Black Knight satellite. Not long after Tesla’s reception, an amateur radio operator in Norway, named Jørgen Hals recorded transmissions called Long Delayed Echoes, or LDEs. A theory by Stanford professor, Ron Bracewell, proposed that these echoes were the product of an alien satellite picking up radio signals from Earth and rebroadcasting them back, creating a delay of several seconds. Some have speculated that the Black Knight could be this theoretical satellite, known as a Bracewell probe. In the early 1970s, a man named Duncan Lunan reinterpreted and examined these LDEs, concluding that they were too strong to simply be echoes of radio signals from Earth. Lunan said he translated the signals and, to his surprise found a map of Epsilon Boötis, a binary star in the Boötes system. Although Lunan doesn’t like his interpretation of the LDEs associated with the conspiracy surrounding the Black Knight, there are similarities in the nature of his discovery and its timeliness. IS THE BLACK KNIGHT SATELLITE REAL? In 1954, there were a few news reports claiming that the U.S. Air Force had discovered two satellites orbiting the Earth. With Sputnik, the first man-made satellite, not launching for another three years, the discovery obviously came as a surprise. But the U.S. Air Force was not the only government agency to notice the satellites. The Venezuelan Communications Ministry also noticed their presence a few years later while tracking Sputnik. The ministry noted that these satellites were moving from east to west, orbiting in retrograde. Aside from the fact that there were only a few artificial satellites in orbit at the time, none would have been in retrograde orbit. In 1954, Donald Keyhoe claimed that a satellite was found to be orbiting Earth. Keyhoe was originally a marine naval aviator who later became the most prominent name in ufology, establishing the National Investigations Committee on Aerial Phenomena, or NICAP. Keyhoe’s claim was picked up by the San Francisco Examiner and St. Louis Post Dispatch. According to the articles, Keyhoe said that the Secretary of the Air Force, Harold Talbott, was aware of the satellites and had even witnessed a ‘silvery, disc-shaped object’ in the sky. Though, Talbott dismissed these claims. Another confounding characteristic of the Black Knight was the fact that it was circling the Earth in polar orbit, a feat not accomplished by man-made satellites until 1960. This type of orbit is typically used for mapping, reconnaissance, and tracking, and often it is done in a sun-synchronous orbit so that each time the satellite passes a particular spot, it is the same time of day. The combination of retrograde and polar orbits makes this type of satellite stick out especially in the late 50s/early 60s when satellite technology was in its nascent phases. And it wasn’t just military entities who photographed an unidentified satellite, but also the Smithsonian Observatory at Harvard as well as the Gruman Aircraft Corporation in New York. But the story of the Black Knight gets even more bizarre with the French Space Commission’s observation of the satellite while Jacques Vallée was on staff. Despite excitement and intrigue by Vallée and his colleagues, a senior member of his team deleted their imaging of the satellite, for reasons unknown. While Vallée said he believed it was out of embarrassment for the commission’s inability to identify the orbiting object, it was becoming increasingly common for agencies around the world to notice the unidentified satellite, without explanation. There are several pictures circulating the internet of what is thought to be the Black Knight. These pictures, taken by NASA, are purportedly images of a thermal cover that was dropped during a spacewalk or extra-vehicular activity on the ISS. During this expedition, one astronaut finished his mission early and was asked to cover the space station’s trunnion pins with thermal covers. The astronaut who was asked to complete this as a free-floating task, did not have the cover properly attached to him, losing track of it and letting it float away. When asked later which pin he lost the cover to, he said he could not remember and that he was too upset with himself to think about it. 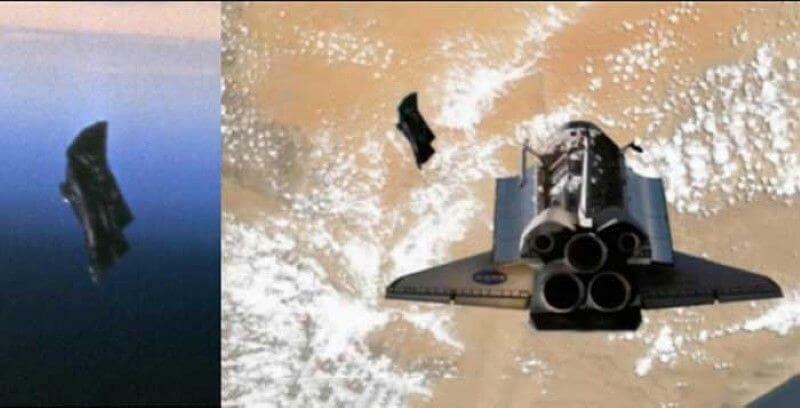 NASA claims that the photographs that most believe are the black knight satellite are simply images of this thermal cover as it floated away from the space station. There is also a video of the astronauts inside the space station filming and photographing the cover as it floats off. It is entirely possible that NASA’s claims are true. There are plenty of similarities between the thermal cover and the images believed to be the Black Knight. There aren’t however, sufficient explanations of the sightings and documentation of the satellite from the 1950s and 60s by numerous government and scientific agencies. In 1963, while orbiting Earth, astronaut Gordon Cooper reported seeing a glowing green light ahead of his Mercury 9 module. He reported it to the Australian Space Command, who were able to track it. Oddly enough, when Cooper returned to Earth he was not allowed to talk about the light and it was reported that he had suffered hallucinations from an excess of carbon dioxide in his cabin. Despite NASA’s attempt to explain what Cooper saw with a more mundane explanation, he continued throughout his life to divulge stories that detailed his experiences with UFOs and other unexplained phenomena. He often spoke of attempted government cover-ups regarding UFOs and unexplained activity, so it would come as no surprise that the Black Knight could be real and its origin being withheld from the public.